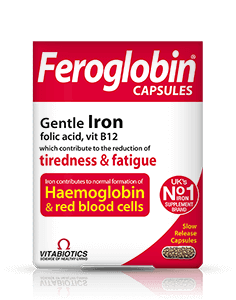 Feroglobin Fizz has been developed by Vitabiotics' nutritional experts to provide effective levels of iron with supporting nutrients in an effervescent tablet that makes a convenient, easy to take, natural orange flavoured drink. 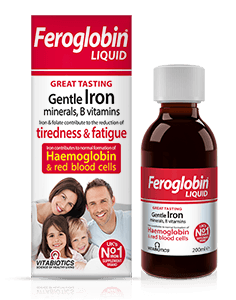 Feroglobin Fizz is suitable for vegetarians and vegans and children from 12 years. The formula is gentle on the stomach and easily absorbed and ideal for women during pregnancy and during menstruation. It may also be of interest to athletes and adults over 50 years. Generally, Feroglobin Fizz can be taken alongside medications because it contains only moderate levels of vitamins and minerals. For specific advice on taking Feroglobin Fizz with medicines, we recommend that you contact your doctor or pharmacist. Each pack of Feroglobin Fizz contains 20 effervescent tablets. We recommend using one tablet daily, so each pack should last 20 days. One tablet is to be dissolved in water to make a refreshing orange flavoured drink and taken daily. Drinking Feroglobin Fizz with a large meal maximises the absorption of the nutrients. 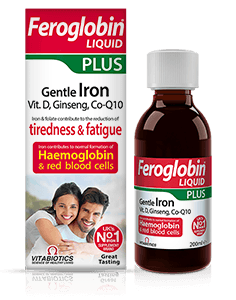 Feroglobin Fizz has no known side-effects when taken as directed. However it contains the natural source sweeteners sucralose and sorbitol, excessive consumption of which may produce laxative effects. Therefore do not exceed the recommended intake. In case of overdose, seek medical advice. As with other supplements, seek professional advice before using if you suffer from food allergies or are allergic to any of the ingredients. Yes, Feroglobin Fizz is suitable for both vegetarians and vegans. As with all other Vitabiotics products, it is not tested on animals.